Elena Mendoza (b. 1973) is a young Spanish composer currently garnering great acclaim on the continent for her music theatre piece Niebla, which is based upon the homonymous novel by Miguel de Unamuno. This Kairos disc is the first dedicated exclusively to Mendoza's work. It is a portrait which features six equally charged chamber pieces, up to and including one of her most recent works, Nebelsplitter, from 2008. An impressive cast of musicians appears on the release, including the ensemble recherche, the Aperto Piano Quartet, Enno Poppe, and the guitarist Jürgen Ruck. Mendoza's music deals primarily in realms of high complexity where the shivering, withdrawing figurations of Sciarrino are infused with a schizophrenic dialectical force, full of definition and vigour. These figurations spin around each other in a driving polyphony, and subtle gradations of timbre, too, imbue the sound with a rhizome dramatic quality. Great technical calculations are clearly at the root of this work, but they are always employed with dramatic purpose, and the music that results is full of detail, event, and frequent moments of arresting (apparent) climax. 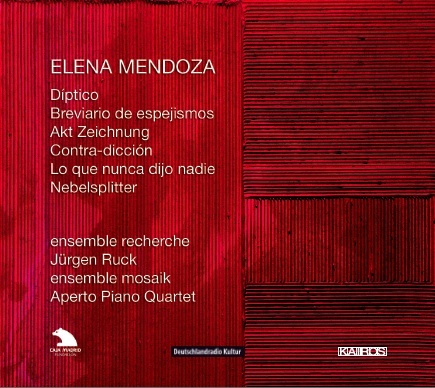 Like Nono before her, then, Mendoza encodes a drama of ideas in her music. And like the Italian before her, she uses sonic symbols, in shape-shifting form, in a web of interpenetrating levels of action such that emotional touchstones, interrogational passages, and degrees of stability, are all constantly confused. Unlike Nono, though, her work is largely non-political, in an explicit sense at least. In Diptico, for an ensemble of clarinet, saxophone, cello, piano, and percussion, members of the ensemble recherche dance around each other fluently in a mobile network of building and resolving tensions, and permanently altering realities. This state of changing multiplicity is created again in Breviario de espejismos for solo acoustic guitar. In that piece a variety of techniques, such as trills, artificial harmonics, complex tonal glissandi generated by use of slide, non-fretting of strings for percussive effect, extremes of range and dynamic, and repeated invocations of certain harmonic intervals, are interwoven, here with great dexterity and attention to sonic power by Ruck, to lead the listener into a prone emotional state. Levels of difference are again interrogated in Akt Zeichnung, which dramatises the notional commingling of voice, and natural speech-patterns, with instrumental forces. Enno Poppe conducts the ensemble mosaik, with baritone soloist Guillermo Anzorena, in a compelling performance full of idiomatic dexterity, local colour, and dramatic tension. Contra-dicción is a three movement piece for two violas. It takes inspiration from late Nono, with the famous inscription he used in three late works 'No hay caminos, hay que caminar' being split up and used as titles for each movement, and the two performers performing at opposite ends of the hall, 'contradicting' each other. Again the notion of difference is here-encoded this time in antipathetic gesturing that gradually coalesces and then separates again-and the sinuous way Mendoza slides each gesture into the other over the course of the work indicates a gift for textural and motivic flair. Duo 10 (violin and guitar) excel in the vocal-instrumental shadowing of Lo que nunca dijo nadie, before the Aperto Piano Quartet bring the disc to a close with a striking performance of Nebelsplitter, a piece that uses some material from the theatre work Niebla. It is a fervent, thrilling work that displays an incredible sliding quality across movements, and between instruments. The piano is prepared with metal and mallet objects such that it appears at times as another string instrument, and material constantly reoccurs from movement to movement, suggesting ellipses within the stability of each movement, but also opening the listener up to the possibility of otherness, to the notion that things we thought complete and whole are still in flux, still without definition. The second movement's etiolated apparitions, unusual in Mendoza's thrusting work, are a particular highlight in the Aperto’s tensile, resolute, exhaustive performance. Here, as elsewhere, Mendoza manages to coerce play, to suggest openness, through the manipulation of the most serious set of materials.